Due to its strategic position near the Dardanelle straits and between Mount Athos and Turkey, Limnos has been since antiquity an important outpost. It has come under the rule of the Athenians, the Roman Empire, the Byzantine Empire, the Genoese and the Turks before it was united with the rest of Greece in 1912. During World War I, the Allies used the island as a base for the Gallipoli campaign. The island spans 477.583 km2 (184mi2), has a population of 18.104 and Myrina is its capital and main port. 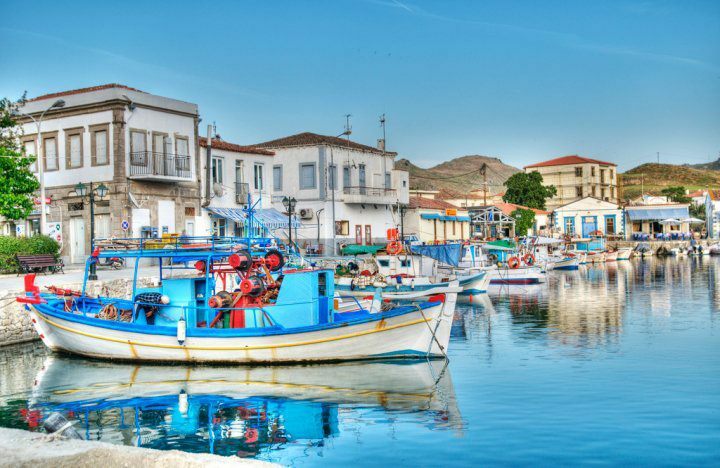 Moudros is the 2nd largest town on the island but places like Portiano, Kaspakas, Atsiki, Katalako, Karpassi, Kodias, with its windmills and Poliohni with an archeological site pre-dating Troy are worth seeing. Limnos is an easy going island so its main attraction are its beaches like Platy, Thanos, Gomati, Kontopouli, and Tigani. Interesting information about Limnos can be found through the Greek Travel Pages (GTP) and Wikipedia. Myrina, which is situated on the western side of the island. There are frequent bus schedules that connect the port with the rest of the island. Conventional ferries: Min 8 hours - Max 20 hours depending on the vessel and the route. Ferry connections and schedules for domestic routes, like to Limnos, are usually announced by most shipping companies, a couple of weeks before the beginning of each season. Afternoon – Three times a week 1 conventional ferry. Morning – Once a week 1 conventional ferry. Information concerning ports serving routes to Limnos can be found further down.